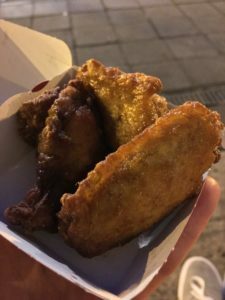 After a day of tourist-ing, beer, and waffles, my wife and I were primed for what all lame, North American tourists should do while abroad: try out the local McDonald’s to see what’s different there. The closest one to us in Brussels’ old city was just minutes away from our hotel, right across the street from the Bourse. The restaurant itself had a fairly new interior, and conveniently had ordering kiosks, which were perfect for surveying the new-to-us menu – especially when you have limited French! Although we were in Belgium and not France, I appreciated that Quentin Tarantino wasn’t lying to us, and their quarter pounder with cheese is in fact called Royal Cheese. Their basic hamburger was just 1€, so we got that for comparison and because it was so damn cheap. I was surprised to see chicken wings (3/2.50€), so we had to see what those were like, and the sweet cheese fries (3.10€) were intriguing. We capped off our meal of shame with two macaron (1.80€). That’s right, McDonald’s in Belgium has the delicate cookies that everyone loves. What could go wrong? Being adults, we had dessert first. 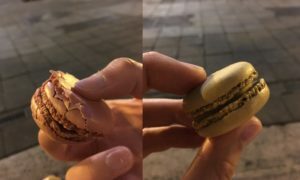 I didn’t have high expectations for macarons from McDonald’s, and those expectations were quite accurate. Although the flavours were good (raspberry and salted caramel), one was pretty beaten up and they were fairly chewy. The chicken wings were probably the best item that we got. They had a lightly breaded exterior that was nice and crisp, and they were a reasonable size. Despite likely being frozen, they didn’t seem to suffer too much from it – which is more than I can say for many pubs back home. Unsurprisingly, the hamburger was exactly like in Canada – not good. 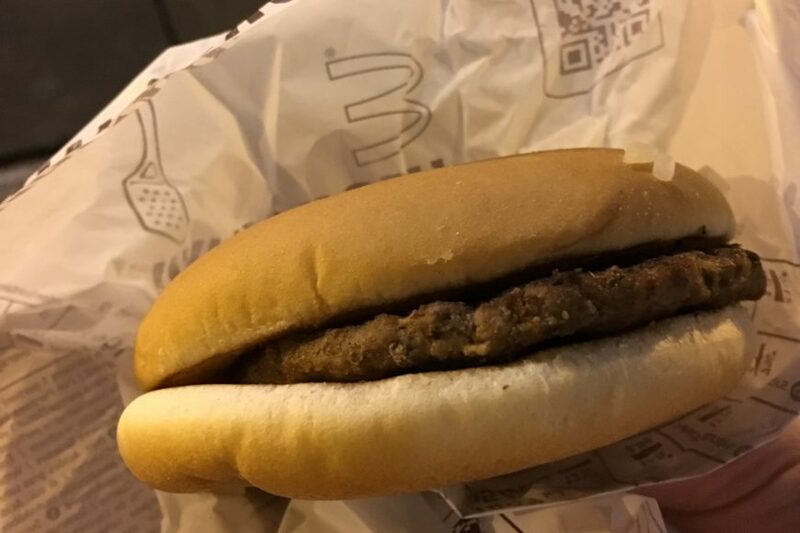 To be even passable, you need the added meat and cheese of a McDouble; the single is just sad. Lifting the top bun off to look at the contents was Nietzsche-esque experience, except in this case the abyss is a grey burger patty with sub-par toppings. I’m not sure what the intent was for the sweet cheese fries, but it didn’t work. 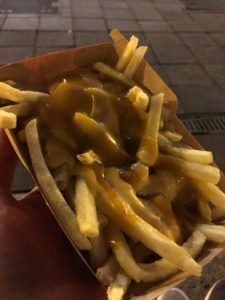 It was like a lazy poutine with a bunch of corn syrup, ruining one of the few things you can depend on at McDonald’s – their fries. 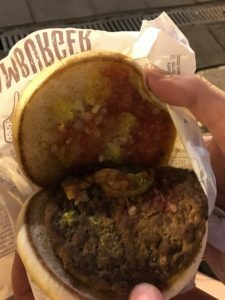 It might not have been the fanciest dining in the world, or the best, but it was at least interesting to try out the commoditized food at a Belgian McDonald’s.